The season to catch large coastal salmon from Northern California to British Columbia generally runs mid October thru early December. Meanwhile, it’s peak time now. These coastal rivers and steams offer opportunity to catch large kings and some coho, too, but the fisheries can be competitive. As a guide we have to be on our game. The best anglers are vying for a chance to catch large Chinook as these are destination fisheries that produce once in a lifetime size salmon. My success is due to many factors, but to consistently catch fish day-in and day-out I need great bait. To stay at the top of my game I use Fire Cure daily. 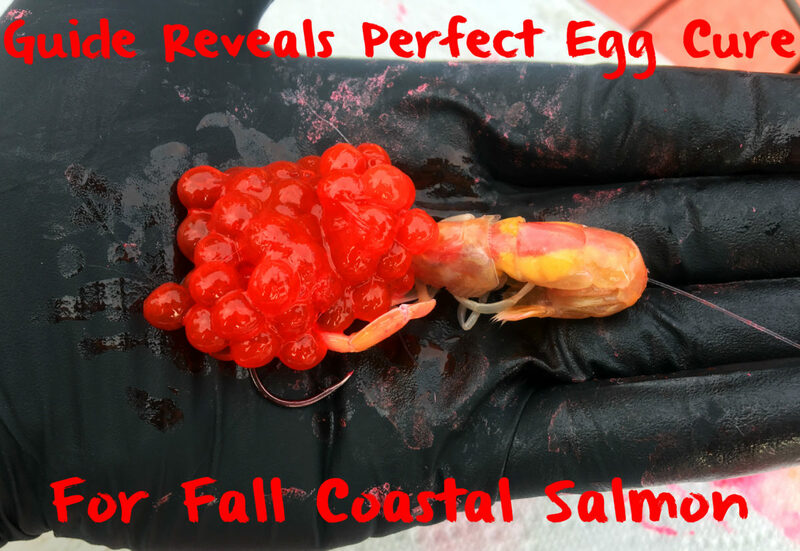 In this blog I’m going to cover how to cure eggs specifically for coastal salmon. This recipe is effective anywhere coastal salmon are found, be it in California, Oregon, Washington and BC, but it also works in the Great Lakes, too. To end up with a good egg you need to start with a good egg. For me, that starts with having skeins with a good egg-to-skein ratio. For example, I like eggs that are not too big and when cured, hold up when back-bouncing. You don’t want berries that are too large and a membrane that’s too thin. You want the skein to be tight. When the egg gets too large they don’t cure as well. Ideally, smaller berries are best. If these berries are the size of a Balls O Fire egg in the skein that’s ideal. You don’t want them much larger than that. If they are too large they’ll break apart too quickly and you’ll go through a lot of bait. If I have to use bigger berry skeins I reserve those solely for bobber fishing because they aren’t taking on heavy current. They’ll break apart too quickly when back-bouncing. I’m sure you’ve heard this many times, but it’s true. To end up with a good egg the fish needs to be bled right away. If there’s still blood in the skeins when you remove them it’s important to do your best to get all the blood out before you cure the eggs. This can be done with a paper towel, scissors, knife or spoon. I like to cut skeins down so they are manageable and easier to prepare. To do so I’ll cut them in half and butterfly them so they cure more thoroughly. They’ll also fit in a Ziploc better and I won’t miss any of the folds in the eggs when adding the cure. After I cut skeins, I try and dry them a bit with paper towel before I put them in the Ziploc and cure. I don’t like a wet egg going into the Ziploc. I prefer a drier egg. Like many well-known guides I use Fire Cure. However, I do tweak it a bit by adding sugar for sweetness and scent. 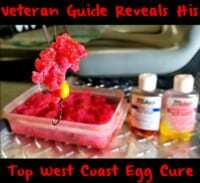 In recent years you’ve probably heard of many guides mixing cures to achieve a specific color egg. For my coastal cure I do this, too. I’ve found it easy to mix colors of Fire Cure in an empty BorX O Fire container. For fall salmon I do a 50-50 mix of Pink and Red Fire Cure. However, prior to doing so I’ll fill a quarter of the container with non-bleached/refined sugar. I also add a heavy dose of Fire Power (krill powder). In fact I’ll use a quarter-bottle of Fire Power with each batch. Then screw on the lid and mix well. Applying the now mixed cured to skeins is basic. Place the skeins in a Ziploc and sprinkle on the cure. Normally, I cure four skeins at a time or roughly a trip’s worth of bait. I try and cure bait at room temperature. After the eggs are covered make sure there’s some air in the bag prior to sealing. This makes tumbling them easier. Continue to tumble the bait until all the skein and eggs are covered with the cure. At this point they’ll start juicing. Once you know the entire skein has been exposed to the cure remove the air from the bag and reseal. While some leave them to cure for several days I fish mine the following morning. If you need bait quickly they will fish the next morning if I need eggs right away. On the other hand, if I have more time I’ll leave them a room temperature for a full day. More time develops an ever better egg. These eggs are ready to be fished and ideal for running with divers, back-bouncing, side-drifting, etc. 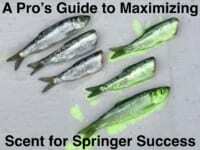 They will fish in all conditions and work for any method you use when fishing roe.